CUPERTINO, CA--(Marketwired - June 25, 2015) - Curriki, the leading K-12 global community for creating, sharing, and finding Open Educational Resources (OER), today announced the launch of the brand new Curriki Global Community, a responsive website designed for educators, students, and parents, that enables easy access from mobile devices, as well as desktops. The new site will be on display at ISTE 2015 in AT&T's booth, #2048, on June 28 and 29 and will go live this summer. Access to excellent curricula often depends on school districts' budgets, and recent years have seen a sharp decline in available monies to support our schools. Curriki provides free, online, multimedia curricula to educators and students around the world. Anyone can join Curriki for free and access myriad Open Educational Resources, contribute their own resources, share ideas, and connect with others. With the new site, it is faster and easier to discover new or "most popular" resources, search for resources by standard, upload, align, and organize their own materials, and create collections by any criteria: lesson plan sets, units, student playlists, video collections, etc. Anyone who works with students, as well as students themselves, will find more than 62,000 ready-to-use materials with the powerful new search tool. Other improvements include: simplified collection building, uploading, and aligning resources to standards. In addition, Curriki has added some exciting new features. Members can now "follow" other members who contribute content they like and connect with peers in collaborative groups, which have been improved with new discussion forums and a streamlined shared resource library. The new website comes with the integration of the OER Rubrics developed by Achieve. This new tool, which will be used by the Curriki Review Team to evaluate resources, will give more detailed information on the value of a particular resource. "Our goal with the new website was to apply our years of experience working with the worldwide education community and leverage today's technology to give educators everywhere opportunities to inspire learning in others and students to become inspired to learn," commented, Kim Jones, Chairman of the Board, CEO, Curriki. "Ten years ago, we were open sourcing software at Sun and I asked, 'Why don't we open source education materials too?' That's when Kim Jones and I founded the very first Open Educational Resource sharing site -- Curriki," commented Scott McNealy, Co-Founder, Board Member, Curriki. "And today, it is a thriving global community of nearly 11 million unique visitors rich with over 62 thousand free resources." Scott is also the former Co-founder, CEO, Sun Microsystems, Inc., and current Co-Founder, CEO, and Chairman of the Board, Wayin. "The NASCAR Foundation is dedicated to helping students make real world connections using science, technology, engineering and math and we would like to congratulate Curriki on the launch of their new dynamic website," said Lorene King, Executive Director, The NASCAR Foundation. "What's special about Curriki is that it is an online community enabling educators, parents, and students to find the finest STEM teaching and learning materials available. The Curriki team has done an outstanding job redesigning the website. It is now mobile-friendly for ease of use by students who use mobile devices for just about everything. Bravo!" "Microsoft, provider of a complete end-to-end solution enabling educators to deliver dynamic 21st century learning experiences, is a proud sponsor of Curriki, which delivers top teaching and learning content, access to games and more to the mobile devices and desktops of passionate teachers and learners," commented Eve Psalti, Global Director, Microsoft Education. 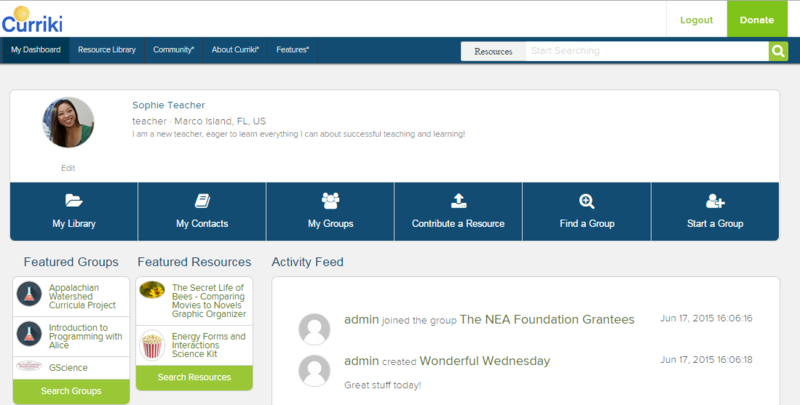 "The new Curriki website will bring an ease of use to finding and sharing OERs that you just can't find anywhere else." A non-profit organization, Curriki is the leading K-12 global community for teachers, students and parents to create, share, and find open learning resources that help teachers inspire learning in their students and inspire students to learn more every day. A Computerworld Honors Laureate for 2012, Curriki was selected as the 21st Century Achievement Award winner for Digital Access. With more than 440,000 members and 62,000+ learning assets, Curriki reaches more than 10.8 million users worldwide. Join today www.curriki.org.